Odysseas is the horizontal Pilot Project underlying the Odysseia Programme. To date it has installed 61 complete computer labs in a total of 64 participating schools (63 Junior High Schools and 1 Primary School), mainly in remote and developing regions: 20 labs in the region of Achaia, 20 across the region of Thrace, and 21 on a total of 10 Aegean Islands. network equipment, 10 or 11 work stations, server, printer, scanner, router, modem, UPS unit, structural cabling. 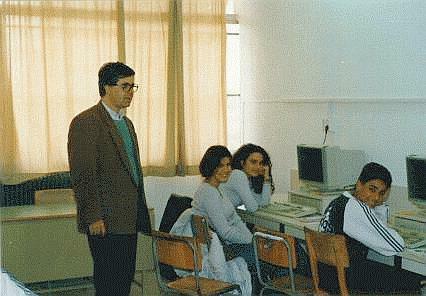 The 61 Odysseas labs were set up gradually, the first phase (including 18 labs) beginning in the spring of 1997, and the second (the remaining 43 labs) being launched in July 1999. These labs were installed more or less in tandem with those set up during the same period under the Mnistires and Askoi tou Aiolou Projects. The Odysseas Project operates with the general guidance, daily supervision and problem-solving assistance of the central administration and support team supplied by the CTI and the Pedagogical Institute. The know-how acquired under this Project has already been transferred to the broader scale of the Odysseia Programme. Cyclades, educational software produced within the framework of the software development and adaptation Projects, network support through the Askoi tou Aiolou Project,E41 etc.). This Project employs pilot teacher educators, 47 In-School Computer Technicians, dozens of engineers, and various other technical, teaching and administrative staff from collaborators within the Programme, from the Ministry of Education and from a variety of other agencies. Finally, a range of pilot exploratory educational software has been developed within the framework of this Project. The Project was completed in June 2000, and all 64 schools have been integrated into the Odysseia schools programme.